For more than two decades PRP therapy has been in use in the several fields of medicine. PRP therapy stimulates hair growth with its unique mechanism of action. The treatment is an alternative to surgical procedures that is minimally invasive and very popular in Birmingham these days. With the help of professional practitioners Platelet Rich Plasma provide amazing results in treating hair loss. Research suggests that PRP injections are suitable for younger patients who are in the early stages of the disease. As PRP therapy is safe and natural there is no chance of getting blood infection. The best candidate for PRP treatment is for the patient who is suffering from hair thinning. Each of the locations in Bringham has at least one certified PRP consultant that can answer these questions more specifically related to the patient’s medical condition and that whether PRP treatment is suitable for him or her. One can plan a schedule with an expert physician or with a consultant to know more about the suitability. Who should not go for PRP? PRP is multiple Injections therapy which takes approximately 60 to 90 minutes. This gives safe and reliable result with no side effects. So this therapy will be a best option for women.PRP is rich in growth factor that contributes to hair growth when applied to the scalp. The treatment is suitable for women who are experiencing hair thinning. The procedure is safe and is long used by orthopaedists to promote healing and growth of tendons. PRP therapy is a cutting-edge procedure to treat hair loss. 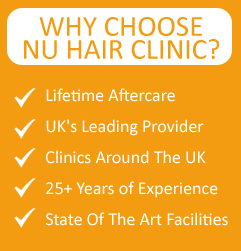 Nu Hair Clinic has specialised in most successful surgical and non-surgical procedures. People of Birmingham are now opting for PRP therapy because most of them prefer natural appearing results compared to surgical procedures. At our clinic each treatment is performed under professional guidance and friendly staff that can make you comfortable.